Is it aliens? Hooligans? Nope, just science. 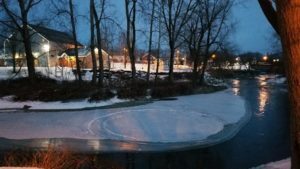 Several Granville residents were mystified by a floating ice disk that appeared recently in the Mettowee River. “It’s a perfect 360. I’ve never seen anything like it before,” he said. The ice disk, nearly 25 feet in diameter, formed and remains floating in the river near the Slate Valley Museum. Obituary: Peter L. Ehntholt Jr.